Summer for me means sea, sun and sand. I have an affinity with waters and this time of the year is the best time to go swimming. While I enjoy this season of sun, I also dread its coming, Why? I easily feel hot.Even a small amount of sun or the humidity will bring me to sweat. I can't bear standing outside for so long- even at 7.30 am sunshine. The Philippines, being a tropical country, can be hellish during summer. With temperature feels as high as 37 degrees, it is unbearable! On days like these, a cold shower is always a temporary relief. Like 3 times of it. I can't always lounge at the beach or drink iced tea all the time to refresh myself so staying in an air conditioned room will be ideal. I have no problems with that at the office where it is always freezing cold. Being at home is a different story. We all know how hard it is to sleep on hot, summer nights. While we have an AC unit at home, the electric consumption is always a consideration. It could jack up electric consumption. People who pays for the electric bill like me knows the feeling. It could bore a big hole in our wallet. But worry not. One can still achieve that cold nights that will put you to a slumber like Sleeping Beauty. :) I recently discovered an efficient AC that gives clean air and is cost saving at the same time. Most AC units have the basic timer, a temperature control system and modes to fit different cooling preferences- but the new Sharp J-Tech Inverter Premium Split-Type Air Conditioner is more than that. 14oC Temperature Setting that enables you to experience the lowest possible temperature even during the warmest summer’s day. Each of these modes are also LED illuminated, color-coded to signify which feature or mode is currently in use and allowing you to easily recognize and change air con status when desired. Aside from giving cooling comforts, the new Sharp J-Tech Inverter Premium Split-Type Air Conditioner is also equipped with the power of the Plasmacluster Ion Technology (PCI).This technology deactivates airborne threats by releasing positive and negative ions in the air. And with the new Plasmacluster Shower design,the PCI technology will continue to release these ions even if the air con unit is not in a cooling mode. This ensures that your home is safe from the dangers of viruses and bacteria anytime. Choose the air conditioner that not only gives you the cooling comfort but offers some other valuable perks too. This summer, keep cool and stay cool for long periods of time without worrying about the expensive cost and unhealthy air. 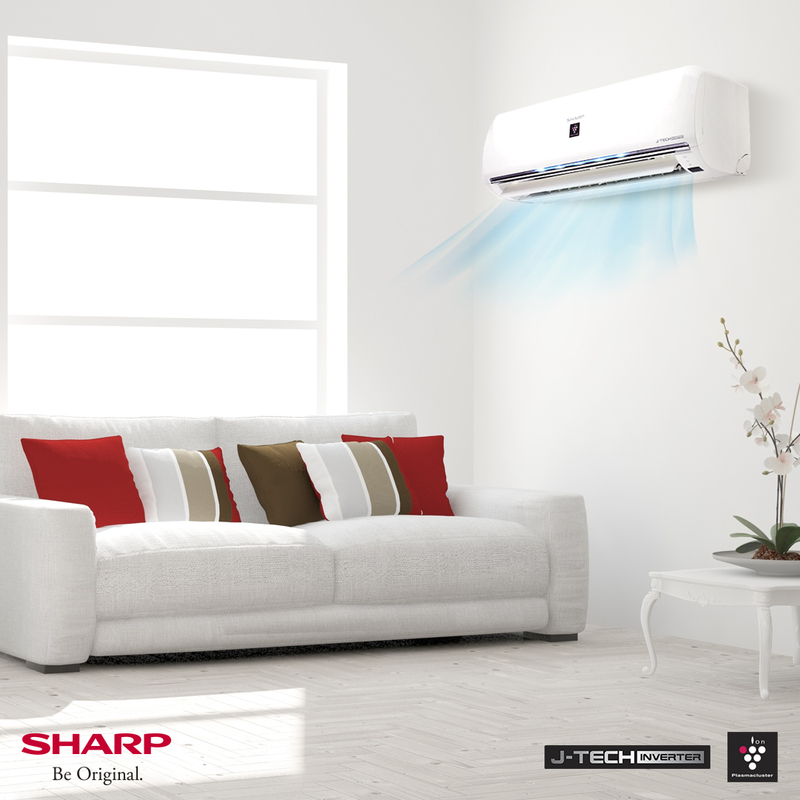 The new Sharp J-Tech Inverter Premium Split-Type Air Conditioner—superb cooling performance for maximum comfort and savings. Visit the nearest authorized Sharp dealer to know more about the new Sharp J-Tech Inverter Split-Type Air Conditioner line-up. You can alsovisit Sharp’s official website at www.sharp.ph or check out Sharp Philippines on Facebook and @sharp.ph on Instagram.